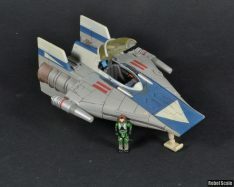 This was a heavily modified AF A-wing. 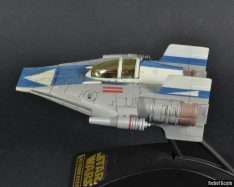 It actually started as a repaint inspired by the unreleased blue A-wing Hasbro promised us. However, the initial concept Ralph McQuarrie drew featured a solid nose, shorter engines, larger laser cannons, and silver exhaust tubes next to the canopy. So, with a little ingenuity, I was able to find similar pieces and mount them accordingly to represent the concept version. 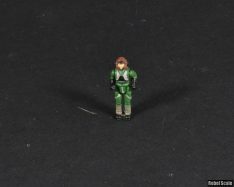 Painting consisted of masking – airbrushing – masking – airbrushing, and so forth. The blue is Polly Scale Blue (23) (USGM 3-1). It’s lighter than most standard blue shades. I finished the model with some light weathering, and decals near the nose (behind the white triangle). Ralph McQuarrie was probably the most renowned Star Wars artist, at least for the original trilogy. 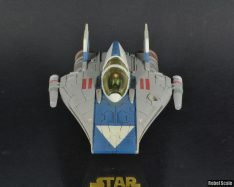 His original A-wing design sported an overall blue tone with white highlights. Of course, due to bluescreen filming, the color was later changed to red. However, this design permeates into today’s collecting. 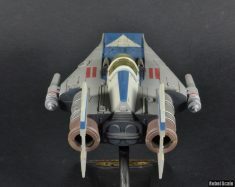 Hasbro was going to release a blue AF A-wing, but canceled the line before it came out. 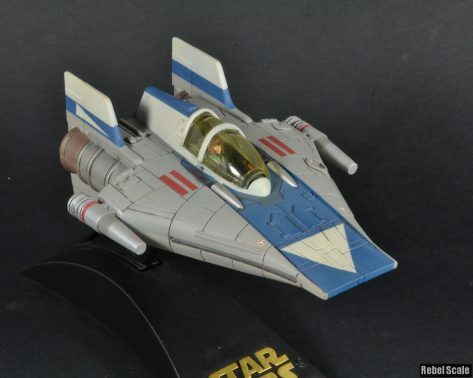 They did release a Titanium version of this A-wing, and many modelers have painted A-wing kits in this color scheme.